Hiawatha Academies is a network of high performing college-preparatory schools focused on closing the achievement gap in Minneapolis. We are creating a college preparatory educational program based on true inquiry, intellect, and character. This is an easy to use website that’s great for the students, teachers and parents. Hiawatha Academies was in the process of completely redoing their branding, using the great marketing team over at Making Waves. As a part of the rebranding effort, they needed a new website. Making Waves partnered with Spark Logix Studios, to create their wonderful new network of websites, the main Hiawatha Academies site, along with the four individual school sites. Making Waves created the designs for each page, and sent them to our team. Our team then built the site using Respondo Pro, our proprietary WordPress Framework. We matched their designs as closely as we could, making only minor adjustments to layouts and spacing to follow responsive best practices. 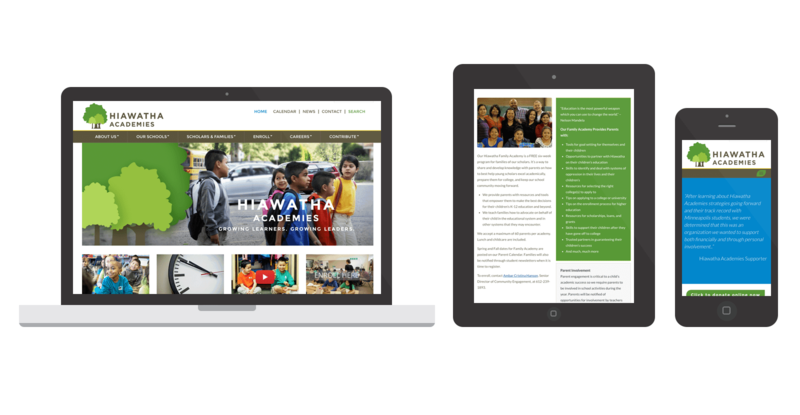 The team at Making Waves was thrilled with the results, and Hiawatha Academies couldn’t be happier with their new website. Easy to manage, part of a multisite install, and beautifully responsive, we were able to meet and exceed the expectations of our agency partner. If you’re in need of WordPress experts, look no further than Spark Logix Studios!